Analysis: Gilbert showcased himself well in the AAF before it collapsed, as he led the league with 2,152 passing yards, 13 touchdowns and three interceptions through eight games. 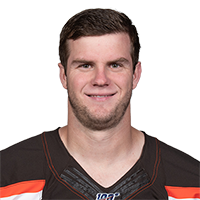 The 27-year-old should be in competition with Drew Stanton for the backup job behind starter Baker Mayfield. Gilbert leads the AAF with 1,357 passing yards, eight touchdowns and zero interceptions through five games with the Orlando Apollos. Analysis: We've reached the halfway point of the AAF season and thus far Gilbert has arguably been the most impressive player out there. It doesn't hurt that he, comparatively, looks much better than other high-profile quarterbacks like Zach Mettenberger and Christian Hackenberg. It'll be interesting to watch whether Gilbert can continue this high level of play down the stretch. If he can, it'll be a surprise if Gilbert isn't in an NFL training camp this summer. Gilbert was waived by the Panthers on Monday. Analysis: Gilbert lost the backup QB job in preseason but rejoined the Panthers ahead of Sunday's season finale, and was forced into action after Kyle Allen (shoulder) exited the game. With its season now over, Carolina decided it didn't need a fourth quarterback with Allen, Cam Newton (shoulder) and Taylor Heinicke (elbow) already on the roster. Gilbert completed two of three passes for 40 yards during Sunday's 33-14 win over New Orleans. The Panthers signed Gilbert to a contract Wednesday, Max Henson of the team's official site reports. Analysis: Gilbert lost out on the Panthers' backup job to Taylor Heinicke at the conclusion of the preseason but will now take his spot on the 53-man roster after Heinicke was moved to injured reserve due to an elbow issue. With Cam Newton (shoulder) still on the roster but not expected to be available for the season finale Sunday against the Saints, Gilbert is in line to serve as the understudy to Kyle Allen, who was promoted from Carolina's practice squad a week earlier. 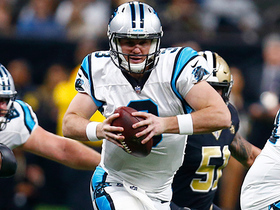 Carolina Panthers quarterback Garrett Gilbert's first NFL pass goes to tight end Ian Thomas for a 31-yard gain.